Our range of products include polyester viscose blended yarn and dyed yarn. 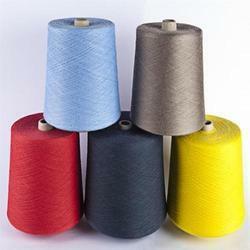 Inferable from our broad years of industry experience and significant business sector understanding, we are giving a wide array of Polyester Viscose Blended Yarn. We have accessed a front place in Polyester Viscose Blended Yarn and we can produce these yarns to suit any stipulations given by our customers. We are offering an elite range of Dyed Yarn to respected clients. The yarn is extensively used to weave light and shrink resistant fabric at several garments industries. Furthermore, our skilled clients can purchase this yarn in vibrant colors at nominal prices.